By 2020, more than two-thirds of Oregon jobs will require post-secondary education, yet only one-third of our high school graduates go on to complete a post-secondary degree or certificate within six years of graduation. Our students need access before they can earn a degree or certificate. Community partners came together and identified that completing the Free Application for Federal Student Aid (FAFSA) was one of the strongest predictors of post-secondary enrollment. Partners went to work with a goal of supporting all students to complete the FAFSA with a focus on students of color, low income, and first-generation students. 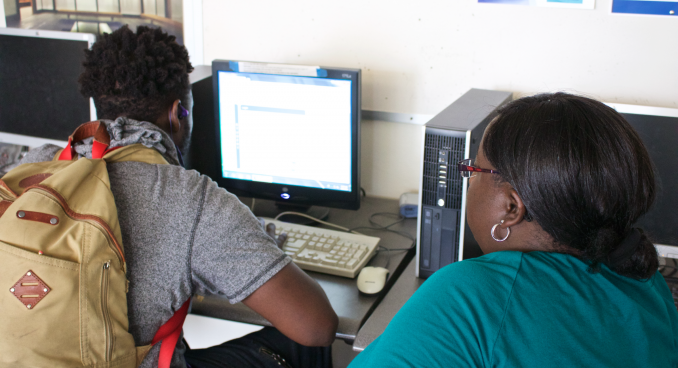 As a result of our collaboration, FAFSA completion rates at eight partner schools have increased dramatically. Two schools, Franklin and Gresham, increased their completion rates 17 and 21 percentage points respectively over the last two years of working together. Additionally, six schools that signed on in 2016 have seen an increase in completion rates of 20.9 points at Alliance, 3.3 points at Centennial, 18.8 points at David Douglas, 12.9 points at Madison, 5.9 points at Roosevelt and 19.9 points at Sam Barlow. County-wide, there has been a 17.8 point increase over the past two years. Today, counselors are swapping ideas across schools, community partners are playing active roles on school teams, and practitioners are actively communicating their lessons learned throughout their systems – and schools are already seeing large increases. Data is driving positive change: throughout 2016, All Hands Raised worked with the Oregon Office of Student Access and Completion to improve the flow of FAFSA data to all schools, giving schools the critical insight they need to understand student-level impacts. In addition, our regular distribution of real-time FAFSA completion rates for local schools continues to inspire healthy competition and a shared commitment to improve. See a dashboard of current completion rates at Multnomah County High Schools here (Updated June 1, 2018). Currently, All Hands Raised is working on the ground with the school community sites below. Click here or on the image to learn more about these teams.